For Obama And Democrats, Immigration Overhaul A Political No-Brainer : It's All Politics It's a given of American politics. The president and political party able to achieve immigration reform, or at the very least appear to be trying hard to do so, are likely to gain the loyalty of voters with ties to recent-immigrant communities. 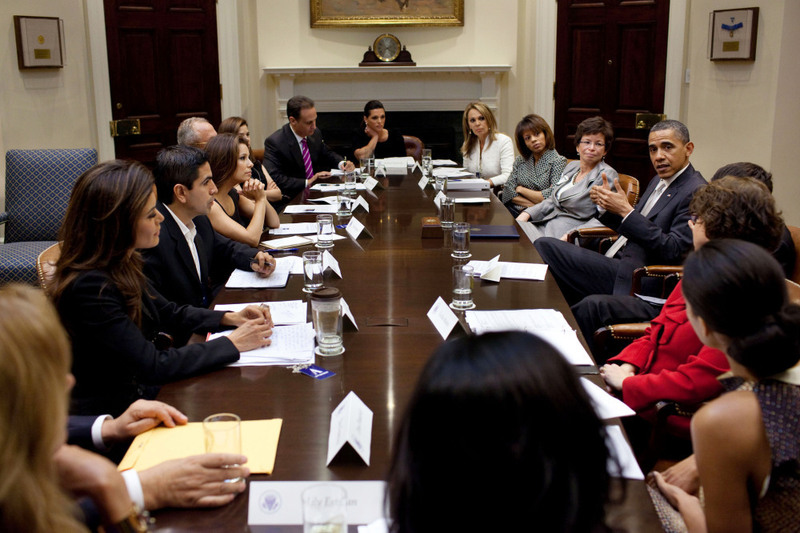 President Obama discusses immigration reform with a group of influential Hispanics at the White House, April 28, 2011. It's a given of American politics. The president and political party able to achieve immigration reform, or at the very least appear to be trying hard to do so, are likely to gain the loyalty of voters with ties to recent-immigrant communities. Also, it's clearly not sustainable for the U.S. to have relatively poor control of its borders and an estimated 11 million illegal immigrants living in the shadows. That's the backdrop for President Obama's visit to the U.S.-Mexico border Tuesday, El Paso, Tex. specifically, to talk immigration reform. As NPR's Mara Liasson and Liz Halloran have both reported this week, the president has been talking a lot with Latinos in recent weeks. It's part of his effort to energize not just an important part of the Democratic Party's base but the nation's fastest growing ethnic group, many of whose members have been disappointed by the administration's policies and lack of results, to date, on reform. For instance, the Obama Administration has prided itself on deportation statistics that have risen on its watch compared with the Bush Administration, especially deportations of undocumented immigrants with with criminal records. But boasting of higher deportations isn't a message likely to win over many Latinos whose families are impacted by such measures, particularly since deportations haven't only affected those with criminal backgrounds. The president also promised in the run-up to the 2010 mid-term elections that immigration reform would be high on his agenda. So promising to push legislation to that end this year is part of keeping that vow. The White House and congressional Democrats also want to take advantage of the fissures on immigration within the Republican Party. By pushing an immigration overhaul, they're banking on immigration hardliners in the Republican Party, through words and actions, doing their part to energize Latinos in the Democratic base. It needs to be said that not all Democrats accept the idea of providing a path to legalization, so-called amnesty, for illegal immigrants. And not all Republicans are against reform. MARA: Republicans say they want to pass bills that would enhance border security — not legalize undocumented workers. But GOP strategist Marty Wilson thinks that's short-sighted. Wilson ran Carly Fiorina's Senate race in California, a race he says she lost because she didn't get enough Hispanic votes. WILSON: The hardline approach on immigration, which is: "find em, arrest 'em, and throw 'em out," is not going to work. Latinos are a growing population in a state like California. They're a growing political force. And unless we come up with a better way to talk about immigration, we're going to continue to way underperform and that does not indicate that you're going to win many elections. MARA: Wilson thinks Republicans should add a guest worker program to their border-security bills. That would allow them to appear welcoming to Hispanics without angering their conservative base with talk of amnesty. Mara also points out that Obama and Democrats generally pretty much view their approach as a no-lose proposition politically. That also makes it a no-brainer. MARA: Right now, it's hard to imagine the two parties finding common ground on this issue. And its possible the president wins either way. If he can get some kind of immigration bill passed, he'll have fulfilled his promise to Hispanic voters. If he can't, he'll be able to argue that it was the Republicans who stopped him.